One of my goals recently has been to take more photos of our family, and then print more of them out. 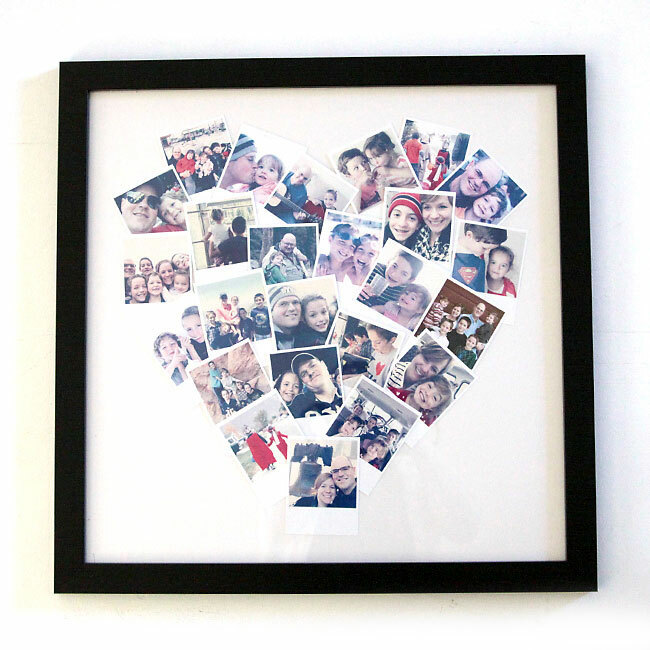 I found this heart photo collage art print available from Minted and thought it would be a great way to get some of my photos off my phone and up on my wall, but I’m a cheapskate. It’s probably not news to any of you that I wasn’t too interested in spending $200 on one framed print. 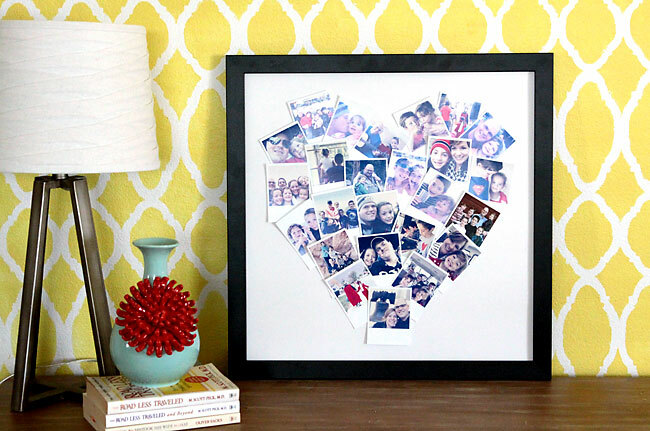 With just a little work, I was able to recreate this heart shaped photo collage for about $40. It turned out to be a very easy project that would make a great gift. I went back through photos from the past year or so and picked out ones that had at least two of our family members together to combine into this collage. I love how it turned out! Click here for lots more photo craft and photo gift ideas! I used a combination of phone photos and photos from my camera. Since there were all from different occasions and had lots of different colors, I used the same photoshop action on each one to give them all the same feel. If you’re using exclusively phone photos, try running them all through the same instagram filter. I ordered my frame from Art To Frames on Amazon . They are MUCH cheaper than large frames anywhere else. I think the quality is good for the money, but be aware that they are not super high quality. The larger size frames come with very thin plexiglass instead of real glass in them, and the first one I ordered had a chip in the plexiglass. The seller promptly sent replacement plexi. Using thing plexi keeps the frames very lightweight, but if you want real glass, you’ll want to look elsewhere. For the background of the photo collage, I just used a piece of white poster board cut to the frame size (20×20). I started by just arranging and re-arranging my photos on the poster board backing until I created a heart shaped collage. I used 25 3×4 polaroid prints. 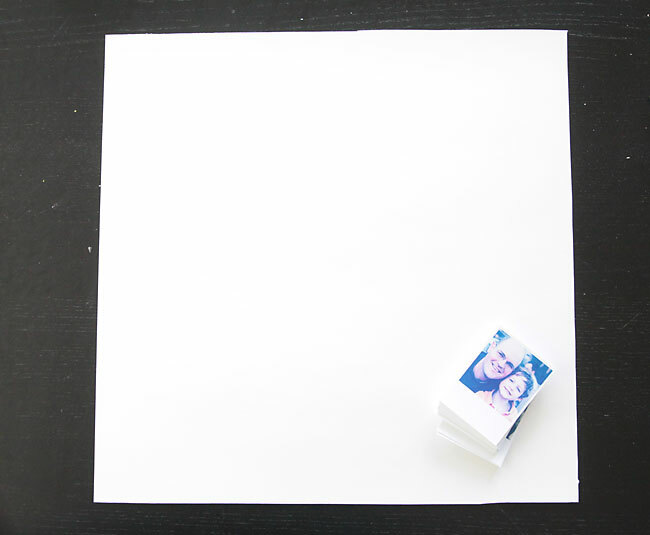 Once I liked the arrangement, I use a little roll of masking tape to tape each photo in place. I just pulled up each photo gently and slid the masking tape beneath it so I didn’t mess up the entire arrangement each time I taped a photo down. I’d originally planned to use glue dots instead of masking tape, but I couldn’t find any. Turns out masking tape was a better choice, because once all the photos were adhered down I realized I wanted to adjust the placement of a few – that was easy to do with masking tape. Because I knew I’d have the display behind glass/plexi in a frame, I didn’t worry about making sure the photos were completely adhered down. If you want to frame this display without glass, you’d probably want to use an adhesive runner all around the edges of each photo. 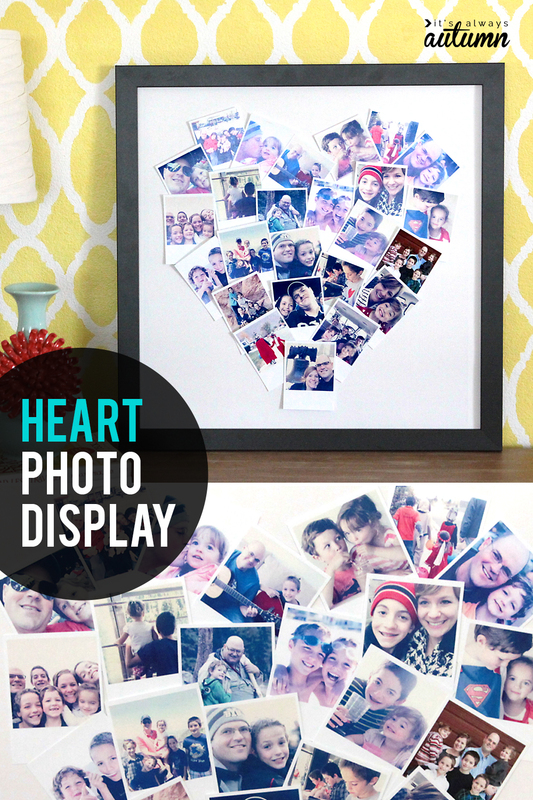 In about half an hour, my DIY heart shaped photo collage was done and ready to hang. 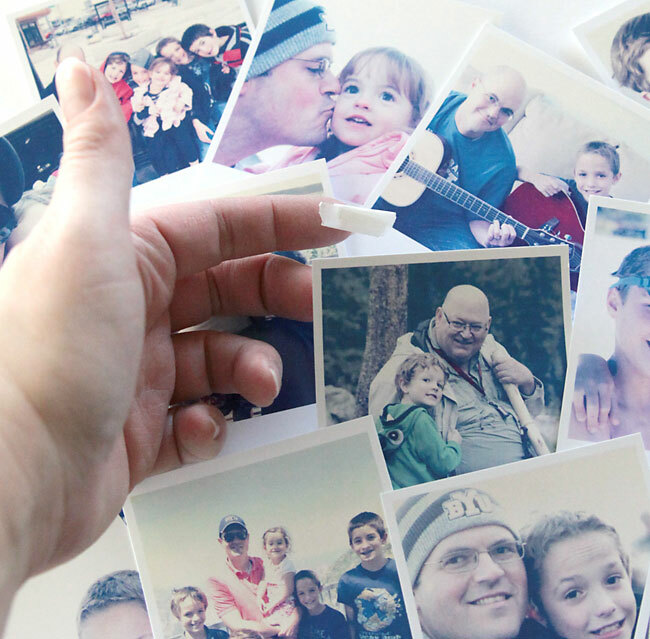 Looking for more photo projects? 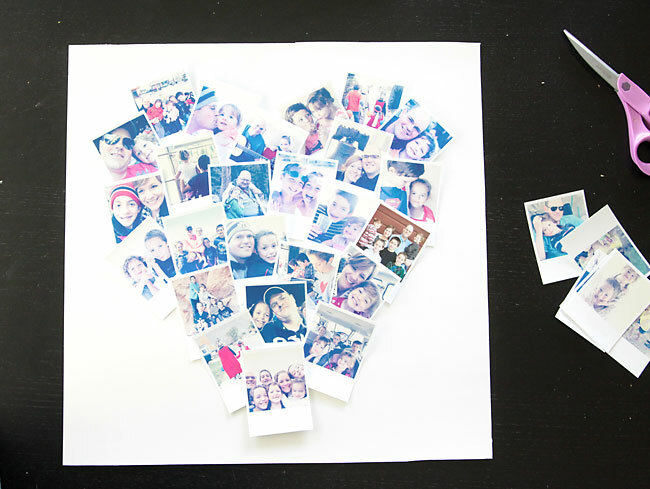 Click here for 40 DIY photo crafts and photo gifts. love this looking for a Mother’s Day thought for my daughter and I think I found it here. Hey where is the photoshop filters from? When I clicked the link, it didn’t go to a correct website.